A well-known 19th century French socialist P.-J. Proudhon, who is almost fogotten nowadays, wrote a laconic phrase: “property is the theft!” Other interpretations of this institute are also possible. Modern medieval studies in Russia have inherited from their predecessors the reverent attitude towards the problem of property. It used to be considered so vital for the soviet-marxist understanding of feudalism, that only few historians were allowed to discuss it. But none was allowed to hesitate about the precise definitions of property. Besides the political and ideological dangers the brave who tried to speak about this topic faced the logical mousetrap. The relations of property were included into the definition of basis, but the fields that the researcher had to deal with to discuss property (law, ideology, culture) were considered as the superstructures. To say the least it made the description of the medieval property in the categories of that time difficult. New generations of Russian historians are already having difficulties with destingwihing such notions as the feudal property, the feudal lords’ property, and the property during the feudalism. Despite our own attitudes towards the soviet inheritance (whether we are proud of it, shrug it off or writhe it our drop by drop) it continues to be the sustained factor in Russian modern historiography. In the beginning of our millenium famous French historian Alain Guerreau published quite a scandalous book “L’Avenir d’un passé incertain. Quelle histoire du Moyen Âge au XXIe siècle?” In this research he criticised the recent French historiography in the hard-hitting way. But in fact the problem is not only in Marxism. His work led to exited debates but at least one of its ideas became a so-called historical fact. We should consider the complete difference of the medieval society from the modernity that began in the 18th century. We can not understand The Middle Ages without two categories: “ecclesia” and “dominium”. So medievalists consider the problem of property in The Middle Ages as very important both in Russia and outside its borders. But this fact does not lead to the appearance of the new researches of the problem of property itself. Such works are very rare. And even worse is the fact that there is no reflection around these few researches. We have a habit to look to the jurists in espectations, but these expectaions do not often hold true. As a result we can see a work of a usual pattern. When it is necessary each researcher speaks about property supposing that there is an orthodox definition of this medieval institute. That is why he will not deal with the content of this institute and will study his own particular problems. For example, how the property was inherited in one or other family, which history he deals with; if the property for the offices, church parishes, or conversion of a part of royal income existed; what the strategies of property accumulation by noble families were, and so on. All this leads to the mentioned time after time so called “cracknel effect” when everything the most interesting is situated on the outskirts but there is a vacuum in the centre. Let us recall the parodox is in the fact that in most cases the researchers who work on the perephery of the circle are sure that in its centre there is a solid ground of certain definitions. It is possible to wait for somebody who will come and renew these definitions, but it is also possible to choose another familiar inductive way, comparing our empiric data, trying to get the discussion of problem of property by practicing historians up and running. In 2017 a spearhead of medievalists from the department of history of The Middle Ages of the Faculty of History of Moscow State University and the Institute of World History of Russian Academy of Sciences made an appempt to take an inventory of existing holdings. 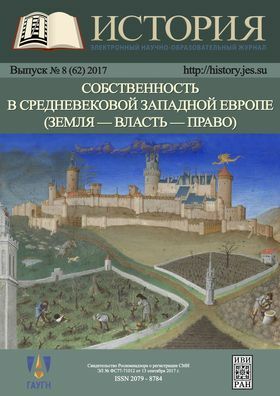 The conference “Property in Medieval Western Europe (Land – Power – Law)” that took place April 17—18, 2017 in the Institute of World History was organised for this reason. We provide readers with its results in this issue of digital revue “Istorya”. They can decide if this conferece satisfied our expectations or did not. But one thing can be taken for sure: published articles are very relevant for the present situation in Russian medieval studies.